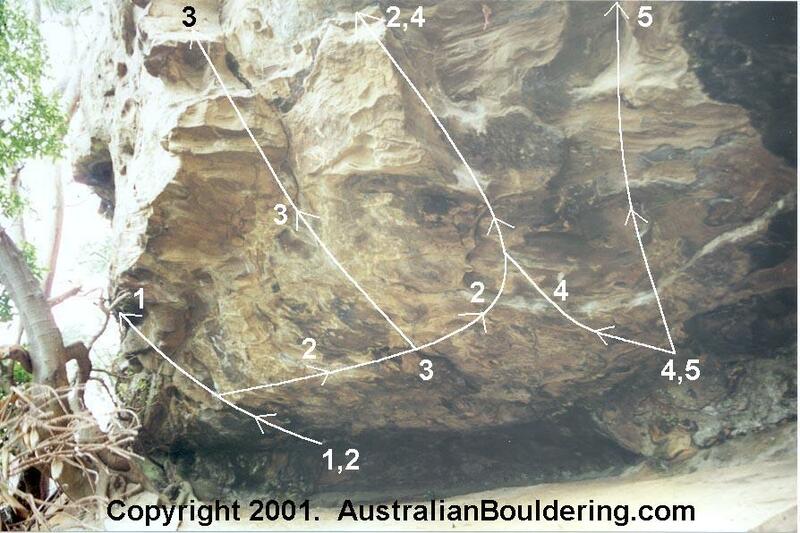 All material contained on this page and any subpage is copyright © 2001 AustralianBouldering.com. All rights reserved. 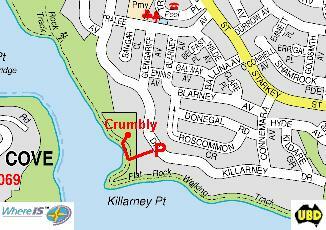 Location: Turn into Starkey St, Killarney Heights, off Warringah Rd and follow it for about a km then turn right into Connemara Rd. At the end turn right again into Killarney Dr, follow it for 100m and park on the grass on the left at the top of the Mosman Rowing Club steps. Follow these steps down for about 50m to the Flat Rock walking track and turn right along the track. After about 50m you'll see the headwall of a big cave up on your right and a faint track heading up the hill to it. This is it. There are more direct paths that can be taken from the parking but with a crashpad they are pretty dangerous so the above approach is suggested. History: Crumbly was first developed as a climbing crag by Peter Martin et al but they overlooked the big horizontal roof starts to all the routes opting for cheater stones and jump starts. It was so named because of a large crumbly section on the right where there was no climbing possible. Then Mike and Dave Kellermann independently discovered the crag on one of their regular boat trips up middle harbour and with the help of Tim O'Neill they realised the potential it held for great boulder problems. There are about 10 problems now ranging from V5 to V13. All the problems are steep and the best are actually horizontal - Chaos and Disorder V11? and Anorexic V5 are arguably the best problems for their style and grade in Sydney! Aspect/Rock: The cave faces SSW so it never actually gets the sun on it making it great for summer and winter alike. The cave is so large that it never gets wet in the rain but it does seep occasionally. 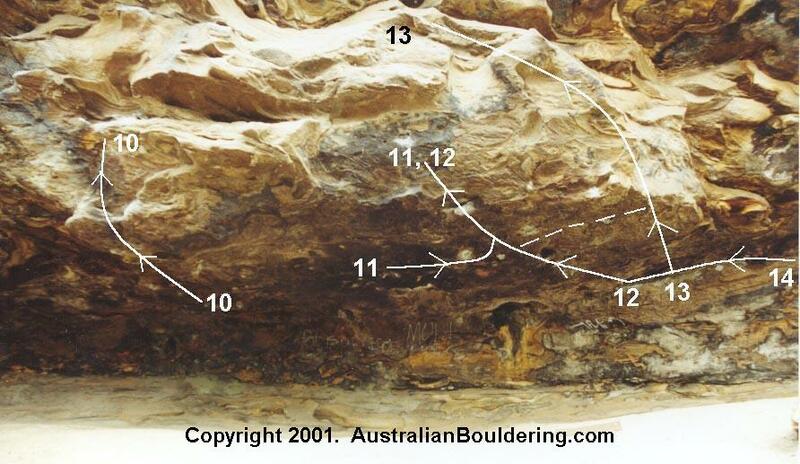 While there is one "crumbly" section of rock the majority of the crag is some of the best quality sandstone in Sydney. There are lovely sandy landings under every problem but beware of the broken glass - the sand has been completely raked twice by the developers but local hooligans ensure it returns every time! Problems: Only the most classic, obvious problems are described from left to right along the cliff and they don't adhere to any rules or eliminations. And finally, while you might not think that there should be bouldering projects, the developers have asked that out of respect for their efforts and their "opening" of the crag, that you please stay off their projects! Start as far back as you can for some big moves to a tricky finish. Watch out for the tree! Start up Nasty, traverse the wall and finish up Sushi Train. Sit start on the big undercling 2ft to the right of Sushi Train with your feet on the back wall and head on up staying right of Sushi Train to finish MATCHED up high on the small slot. Superb. Variation: Abacus V11 ** standing-start (FA: Tim O'Neill) Standing start on the pinch at head height and finish as per the sit-start. Start matched on the underclings near the back wall and begin the chaos ... finish matched on the big jug up the face. Start matched on the big undercling and head out right to finish up Anorexic. Variation: Finish up Exodus for V9. Start matched on the back wall then some gymnastic moves to a difficult finishing slap, match and cut-loose. Variation: Finish up Exodus for V8/9 - has been done since broken hold but is a touch harder. 13. Exodus V10 scary ** (FA: Tim O'Neill) - unrepeated since broken hold. Out Anorexic's footholds for a pumpy and scary finish. Variation: Finish up Anorexic for V8/9? Variation: Just do the scary finish starting from Anorexic for V7? Traverse right to left to the start of Anorexic. Has been linked into Anorexic for an extra grade or two but it's not worth the trouble. There are various problems further to the right but most are not worth doing as they are and/or the rock is poor quality. The exception is a sit start problem near the bottom of the dicey access gully called Give it to me baby V3 * (FA: Kyle Dunsire).